The Retro-Adapter-Professional is for use with Nikon SLR-Cameras (e.g. Nikon D50/D70/D70S/D200 etc.). 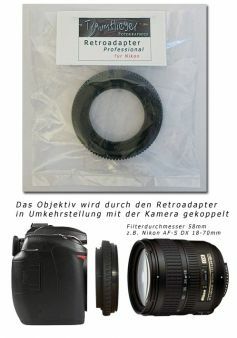 For future use you can adapt it with separate filter-adapter-rings (not included) to other lenses. You can magnify with the adapter up to a factor of 5:1 (normal macrolenses go only to 1:1).